The Saturn in Libra people are very balanced people who will weigh the pros and cons before making a decision. Fairness is the most important thing to Libra zodiac sign. 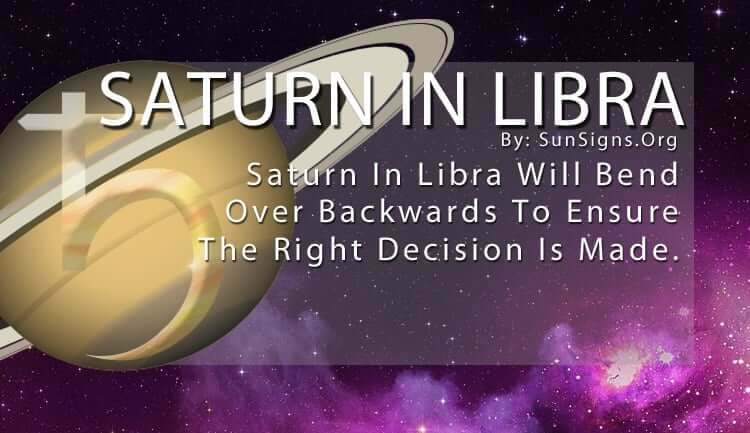 Saturn in Libra will bend over backward to ensure the right decision is made. They can see both sides of an issue and determine the just outcome. But they often lose themselves in the more personal interactions because of this obsession. Saturn represents Karma, ambition, control, restrictions, responsibility and learning from your mistakes. This is not a problem for Libra. They are always cautious in their endeavors. They take their time to weigh the pros and cons of everything before rendering their final verdict. But while this can be very helpful in dealing with other people’s problems, it sometimes hinders the Libra Saturn people in figuring out their own. The Saturn In Libra have to adapt their social skills to balance between their self-regulated tendencies and the affection they have for other people. They have to treat their life as they would anyone else’s problems by finding the right mix of business and pleasure. It may take some time, but eventually, Saturn in Libra will have to choose a direction. And when this happens, everything else will fall into place. Saturn in Libra has the discipline to maintain the kind of lifestyle they want; they have to go after it first. They have to overcome their fear of the unknown and take some risks to move ahead and find more opportunities. And when things don’t go their way, they have the patience and stamina to put themselves back on track. The Saturn in Libra people aren’t as confident when it comes to their wants and needs. So they are incredibly indecisive. This is often detrimental to their day-to-day activities, never mind the bigger decisions for their career or romantic life. They don’t want to make a mistake when it comes to dealing with a family member or choosing a partner. So they sometimes opt out of choosing at all. This is where Saturn in Libra often has problems dealing with those closest to them, who may be relying on them for something that they are afraid they can’t deliver. They are professionals when it comes to dealing with complex problems at work or among those they have no personal ties with. But they become nervous and anxious when it comes to family or friends. If they are to keep their social circle close (and as social butterflies they need to have that kind of network around them), they have to take more decisive action. Saturn in Libra often feel held back in their convictions. So they need to learn to let it out and not be afraid of the consequences. They are too rigid in their fear and doubt. This can hold them back from finding that special someone, or from building stronger relationships with those they already know. All this Libra Saturn person has to do is score little personal successes here and there to build up their self-confidence. Once they have acquired this skill, they can build upon it to do even greater things in their lives. It’s all about perspective for Saturn in Libra. So they have to turn things around to be in their favor. But that requires taking responsibility for their actions, and this is a lesson that takes time. Once they master it though, there’s nothing they can’t do!